Everton ban the Sun newspaper "from all areas of its operation" after columnist Kelvin MacKenzie's article on Ross Barkley and the people of Liverpool. It's a comfortable enough win for Everton in the end, although they had to negotiate a few hairy moments. Ross Barkley answered a few of his critics, and Everton will surely be in the Europa League next season. Burnley probably need one more win to be absolutely certain of survival. I suspect they will probably get it at Turf Moor. Thanks for your company this afternoon; I'm off to write the match report for the website and gather some post-match reaction. Goalkeeper Joel Robles plucks a cross out of the air with confidence. All Everton's stresses and strains of half-an-hour ago have disappeared. Final change for Everton, and it's a standing ovation for Ross Barkley, who has been excellent this afternoon. Ademola Lookman is on in his place. Burnley applying a bit of pressure in the closing stages - Ross Barkley is back defending at a corner to clear the danger once more. Dan Agyei replaces Ashley Barnes for the closing stages. Joey Barton tries to force a ball through to Andre Gray inside the penalty area, but Everton have enough man back there. Two substitutions in the midst of that goal flurry to tell you about: Andre Gray is on for Sam Vokes in Burnley's attack; Gareth Barry has replaced Kevin Mirallas to give Everton more of a shield in the closing stages. No doubt about the scorer of Everton's third goal, and that should be the three points. Romelu Lukaku turns Michael Keane and wallops a shot past Tom Heaton at the near post after Leighton Baines takes a short throw to Ross Barkley and receives a return pass to play the striker in. That's nine successive home games in which Romalu Lukaku has scored. It's his 25th goal of the season. 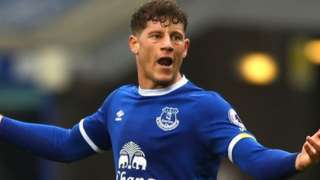 Ross Barkley is certainly claiming the goal that restores Everton's lead - to the extent that gets a booking for going into the crowd to celebrate. But it may well go down as a Ben Mee own goal. Barkley takes on Kevin Mirallas' shot and weaves in from the left to shoot. It hits Michael Keane, then Ben Mee, and bobbles into the far corner. Morgan Schneiderlin and Joey Barton, neither of whom are wallflowers, almost come to blows. Barton gives his Everton counterpart a whack on the shin, and there's a bit of afters a moment later, which ends with Schneiderlin jabbing his finger at the Burnley midfielder in the manner of an angry constitutent tackling their MP. Mark Clattenburg has a word and all is settled amicably enough. Not sure I agree with Danny Mills, but he's played professional football as a defender and I haven't, so I certainly won't argue. I think that's a blatant penalty. The ball was hit hard but Michael Keane's hand is away from his body. A spot-kick, for me. Two chances in quick succession come and go for Kevin Mirallas. Tom Davies spreads a wonderful pass left for Leighton Baines to cross low from the left; first Mirallas slices straight into a defender, then sees the ball come back to him and wallops it goalwards, hitting the outside of the post. Everton substitute Enner Valencia wallops a shot straight at the hand of Michael Keane. The home fans appeal for a penalty, but it's ball to hand by the Burnley centre-back, and Mark Clattenburg is right to reject the pleas of the home faithful. Everton's apprehension has spread to the front players as well. Ross Barkley makes a terrific run at the Burnley defence, then slides a pass left for Kevin Mirallas to hit first time. It's screaming to be placed into the far corner, but Mirallas' shot is weak and straight at Tom Heaton. The Goodison groan is loud and clear. Joel Robles is having a difficult few minutes. First he shanks a clearance out for a throw, then he fails to come from a cross and gets an absolute earful from Phil Jagielka. I used to play in goal when I was a kid. I know exactly what Robles is going through at the moment; I suspect the ear-bashing won't have done him much good. Mind you, at least Robles hasn't been substituted during a game for playing badly, as I once was as a goalkeeper at Under-12s level. Now that was embarrassing. Well, that's woken everyone up. Burnley midfielder Joey Barton has a crack from 25 yards, and the shot sails over. The visitors look as if they fancy the win here. Oh dear. What a nightmare for Joel Robles. Sam Vokes is going nowhere as he heads towards the left edge of the penalty area, and the goalkeeper charges out to bring him down. It's an easy penalty for Mark Clattenburg to give. Vokes sends Robles the wrong way from the spot. It's only Burnley's 10th away league goal of the season - and five of them have been penalties.